This article explores the application of virtual environments to 3D geospatial visualization and exploration. VR worlds provide powerful functionalities for model generation and animation and are indeed a valuable tool for geospatial visualization. Subsequently, related issues such as the constraints in progressive terrain rendering, geographic data modeling, photo-realism in virtual worlds, and the system performance with relatively larger files are discussed. Nevertheless, to accomplish the desired results and to attain a higher level of functionality, a good level of experience in VR programming and the jurisprudence to choose the appropriate tool are necessary. Although a standalone VR application is not capable of a higher level of interaction, using the SCRIPT nodes and the External Authoring Interface additional functionalities can be integrated. Intended for use over the internet with a VR browser, such virtual environments serve not only as a visualization tool, but also a powerful medium for geospatial data exploration. 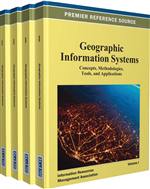 Since the 1960s and 70s, the past several decades have witnessed the ‘information revolution’, particularly in the domain of spatial information technology, propelled by the advancements in data acquisition techniques. The evolution of diverse digital processing and image generation techniques over the decades along with the parallel developments in Geographical Information Systems GIS and remote sensing have resulted in colossal volumes of digital spatial data. In order to make the utmost use of this collected data, they must be presented in the form of comprehensible information. Geospatial data is increasingly being used for addressing issues involving environmental and urban planning, design, and decision-making within a wide range of disciplines ranging from urban landscape management to various other applications. As geospatial data complexity increases, besides the standard rasters, Triangulated Irregular Networks (TINs) and Digital Elevation Models (DEMs), which are used for data exploration, additional tools such as photo-realistic models are needed to provide advanced visualization and query functionalities. Three-dimensional visualization is a proven technique for exploring geospatial data (Bonham-Carter, 1994). In the work on urban modeling, Shiode (2001) explains the development of 3D models and their role within the domain of spatial information database and remote sensing technology. The origins of concept of spatial immersion can be dated back to 1965 when Ivan Sutherland (1965) made known the ideas of immersion in virtual space in his influential work, “The Ultimate Display”. Such immersive virtual environments can serve as handy tools for scientists and researchers that handle enormous data volumes. By and large, visualization enables large quantities of information to be presented in a form that is comprehensible to a wide range of users (Colin Ware, 2000).